August is a time of transition on the farm, with summertime favorites still lingering and hints of fall making an appearance. All of the fields on the farm are busy right now. Some are yielding fruit. Others are being pulled into beds and being prepared for planting and others are nourishing little plants that will be harvested soon. We have a crew devoted to transplanting fall crops. When I was a kid, we spent many weekends transplanting plants into fields. Back then, it was all done by hand. Ricardo would run the tractor over the beds, dragging a piece of metal in the dirt that would open up a small ditch. One set of people would then walk down the row plucking the little plants out of the tray and dropping them at the correct spacing. At first, I was skeptical of the spiralized vegetable trend, but the more my friends raved about spiralizing nearly everything that came out of their gardens, the more curious I became. I went to the kitchen store for a simple, hand-held model, but came home with an upgraded, hand-crank version and began experimenting. 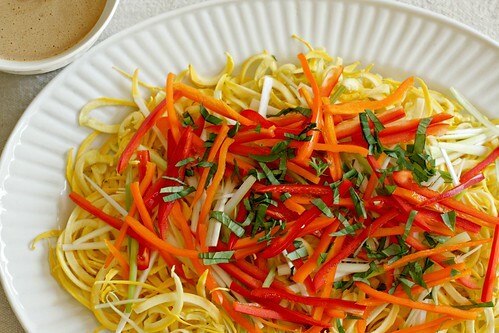 My friends were right - vegetables do indeed taste different in noodle form, and when traditional noodles aren’t a part of your diet, it’s a delight to have a healthy alternative to serve with your favorite sauces. 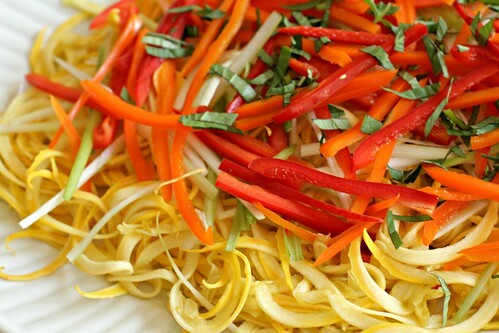 Spiralized vegetables and fruits add visual interest and delicious texture to a variety of dishes. Here are a few that have been a hit with my family. 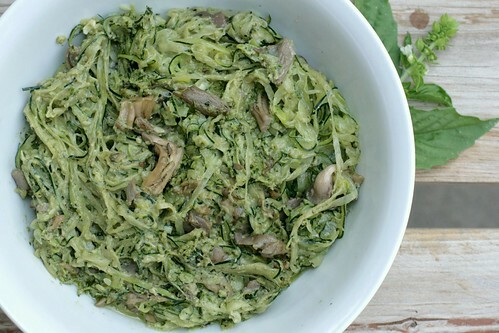 Many spiralized zucchini recipes recommend draining the moisture from zucchini noodles before cooking, but I find this process to be time consuming and the results not worth the effort. Heat 2 tablespoons avocado oil in a large skillet over medium heat. Add mushrooms and sauté for 6-7 minutes, then add sliced garlic and sauté for several more minutes, until mushrooms are soft and garlic is fragrant. Remove mushrooms and garlic from skillet and set aside. Add a little more oil to the skillet along with the spiralized zucchini and sauté for 8-10 minutes. Add mushrooms and garlic back to skillet along with pesto and stir to combine. Serve warm topped with toasted walnuts. In a food processor, combine basil, walnuts, Parmesan cheese, garlic and salt, and pulse until finely minced. Slowly add olive oil, and pulse to combine. For a print friendly version of this recipe click here. In a food processor or blender, combine dressing ingredients, and blend until smooth. Julienne sweet peppers, green onions and Thai basil. Layer the vegetables on a plate or in a large bowl, and top with dressing just prior to serving. How To Add Produce and Farm Products for these Recipes To Your Delivery: CSA members - head on over to our online Farm Stand Market to customize your upcoming delivery. The Market is open from noon on Thursday until 10 am, 2 days before your scheduled delivery day. After you confirm your produce items, click the orange button "Confirm and Continue To Other Farm Products" to add the products to your delivery. Our farm skies have been interesting to watch this past week. I spied some early geese making a “V” along the creek, and later that evening, I caught a few meteors burning in the night sky. During the day, it is usually clear and hot; other times, it is cloudy and hot, and for a couple days recently, a local fire made it smoky and hot. We adore the classic, rich flavor of a traditional basil pesto, but we also have fun playing with alternative ingredients to create different flavor and texture combinations. 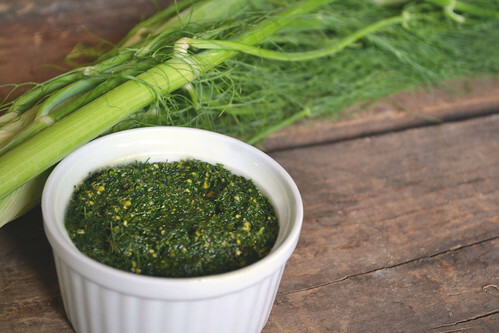 Check out some of our favorite pestos and suggested recipes for pesto meals. 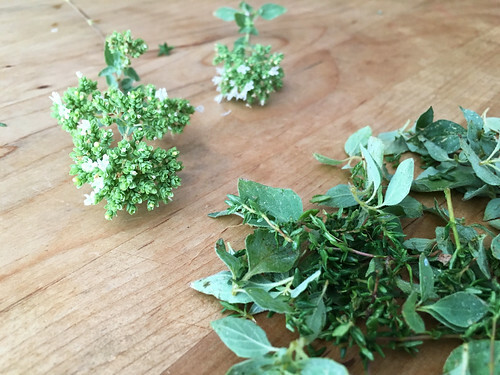 Wash basil leaves and thoroughly dry by patting with paper towels. 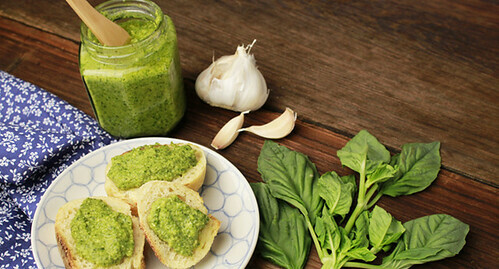 Place basil leaves and garlic into a food processor and pulse until the basil and garlic is finely chopped then slowly add the oil until well combined. Add in the pine nuts, Parmesan cheese, and lemon juice and process until the pesto is mostly pureed and well mixed. Season to taste with salt and fresh ground black pepper and pulse a few times more. Store in the refrigerator in a sealed reusable container for up to a week. This recipe is actually kind of a pesto and tapenade mash up, with nuts (which is typical of pesto) and capers (which is typical of tapenade). In a food processor or blender, mix the carrot tops, capers and garlic until roughly combined. Add the pistachios and while blending, drizzle the olive oil in. Add salt and pepper to taste. 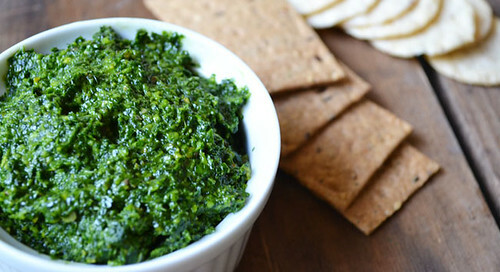 You can make this pesto in a food processor or by hand. If you make it by hand, just chop everything up very fine and mix together until well combined. . Remove the large parts of the stems from the cilantro and parsley. Put them in a food processor and pulse for a few seconds to make room for the other ingredients. Add in the pistachios, garlic and lemon juice and blend. With the food processor running, pour the olive oil into the pesto. Season with salt and pepper to taste. Mix into your favorite pasta, eat with crackers, mix into scrambled eggs or spread on a tortilla. Using a food processor or blender, combine all ingredients until smooth and combined. Enjoy on sandwiches, stirred into your favorite pasta or as a dip. 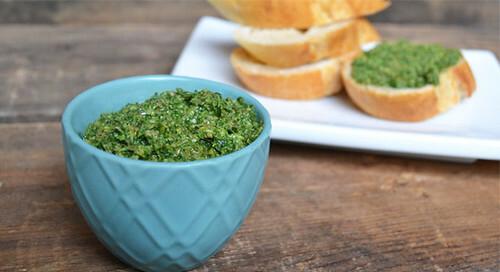 Find more pesto variations and suggested recipes for a delicious pesto meal any time of the year. The tomato plants have grown to their full size. In many cases, they are a wall of green, sticky foliage, supported by stakes and string. 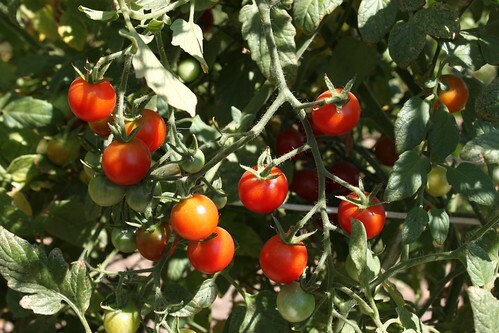 The field is a set of tomato walls, seven feet tall, two feet wide, spaced five feet from the next wall of vines. 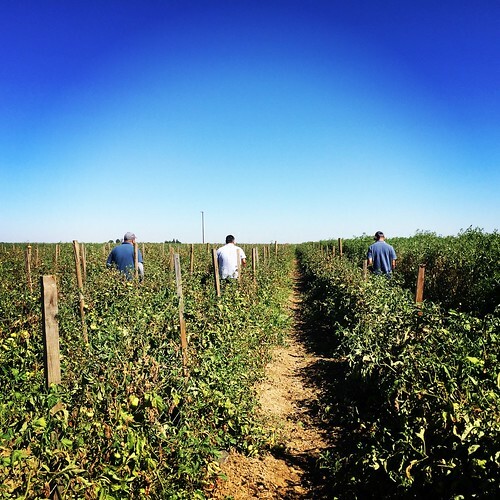 Walking a tomato field is made difficult by needing to choose which row you are going to look at and realizing that you are committed to walking that row until the field ends – it is not possible to move to the next row in the middle of the field. 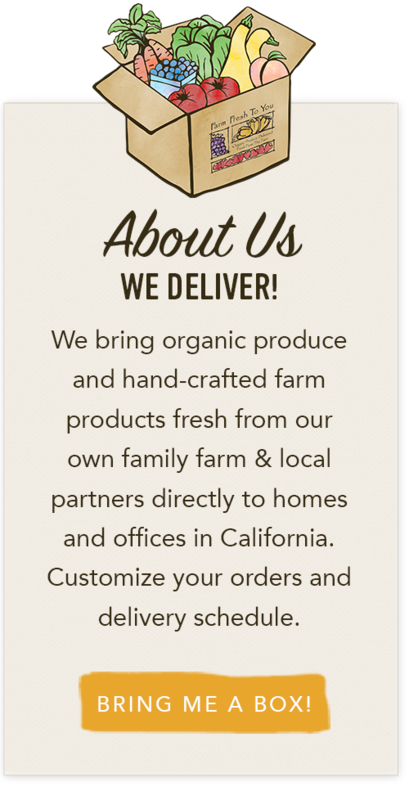 Add Recurring Items To Your Produce Delivery! We have to admit – it is kind of a warm, nostalgic feeling to have your milk bottles delivered to your doorstep. 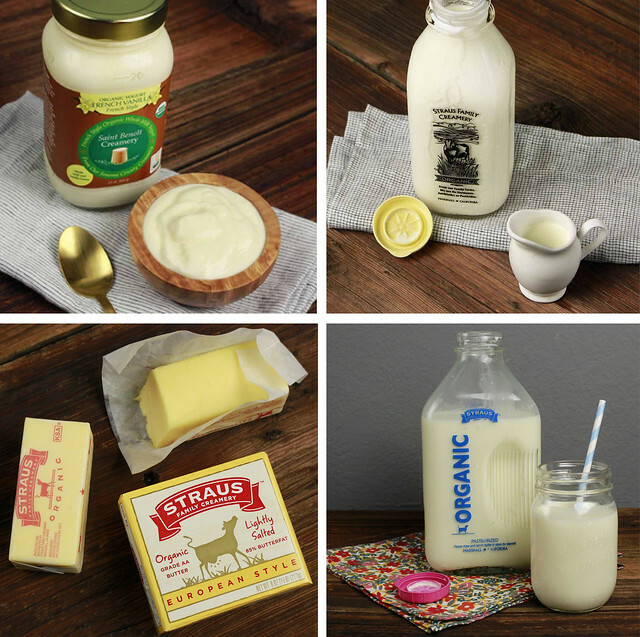 We hope you try these top quality dairy products from some of California’s finest family-owned dairies including Saint Benoît Creamery and Straus Family Creamery. Add milk, half & half, sour cream, butter and yogurt to your deliveries. 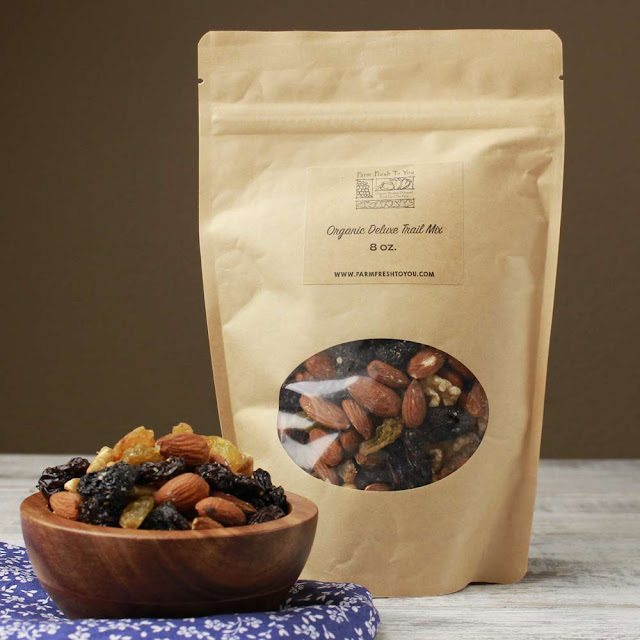 This delicious mix features huge, juicy organic golden and crimson raisins, and organic dried cherries from Hidden Star Orchards, organic walnuts from Old Dog Ranch, and organic whole almonds from Capay Hill Orchards. 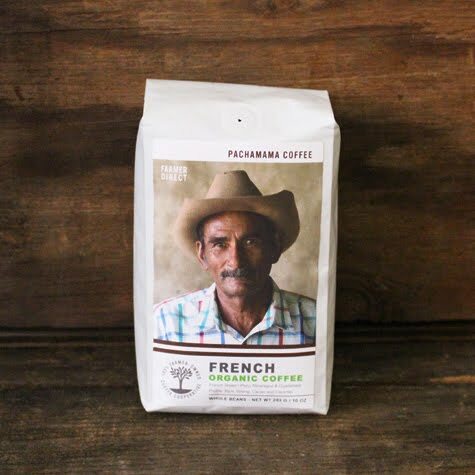 This organic French Roast premium blend coffee is brought to you by The Pachamama Coffee Cooperative, a unique global cooperative that is wholly-owned by small-scale coffee farmers. This tried-and-true blend is roasted in small batches in California and is well known for its bold, strong and smooth flavor with subtle notes of dark chocolate. Our organic, cage-free eggs are produced in sunny hen houses that feature 100% natural ventilation, except during the cold winter months when the hens need protection from the elements. During the day, hens have open access to the outside. 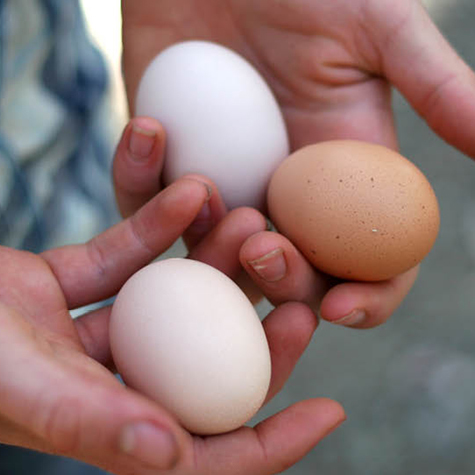 Pasture-raised eggs come from hens that enjoy access to green pastures during the day. At night, the hens sleep in hen houses to protect against natural predators. The hen houses contain roosts, scratching areas and hay for comfort. Hens are raised without hormones and antibiotics. 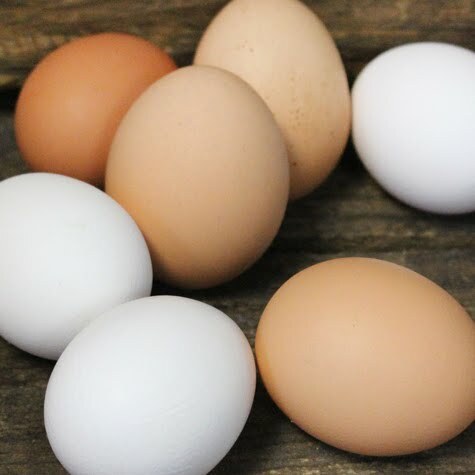 In additional to natural foraging, hens have access to supplemental feed and water. 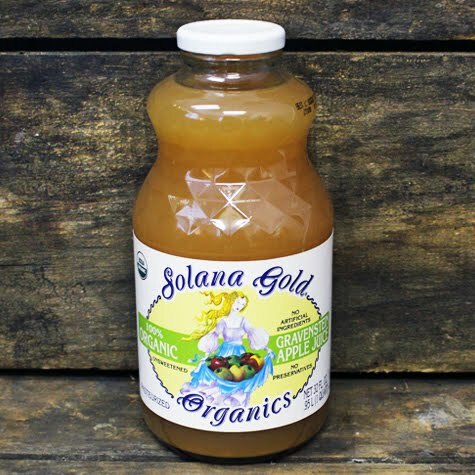 Grown in Sonoma County, this organic apple juice is made from freshly squeezed, whole, double-washed, ripe organic apples. Many of these Gravenstein apples were grown on trees that are over 100 years-old. Especially delightful for those that prefer a less 'sweet' apple juice with a tart edge to it. Log in to your online Farm Fresh To You account at www.farmfreshtoyou.com to easily add your choice of trail mix, coffee, eggs or apple juice as Recurring Items. From your Manage Services page, scroll down to Manage Services and click "edit recurring items". Choose the amount of any or all of the items we offer and receive them with each delivery. Click "Update my Service" to save your changes. A local wild fire has left the air thick over our farm. The hills are not crisply seen, but filtered through a gray lens. The days feel muggy. 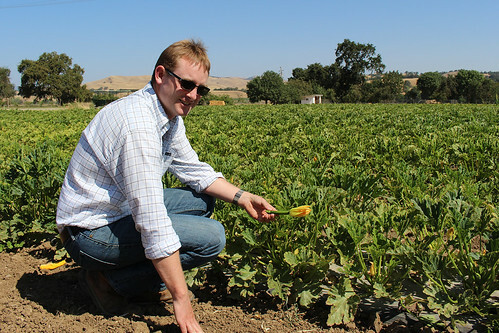 The crops continue to thrive with the warm days and cool evenings. The sun has a vastly different look as it sets beyond the hills to the east. Through the smoke, the sun looks like a huge fireball, burning just beyond the haze, and the colors of the clouds and sky are enough to stop me in the middle of what I am doing to enjoy the show. It's been such an amazing experience hosting farm events over the years. We appreciate the opportunity to partner with talented community members and a chance to get to know many of you on a more intimate level. 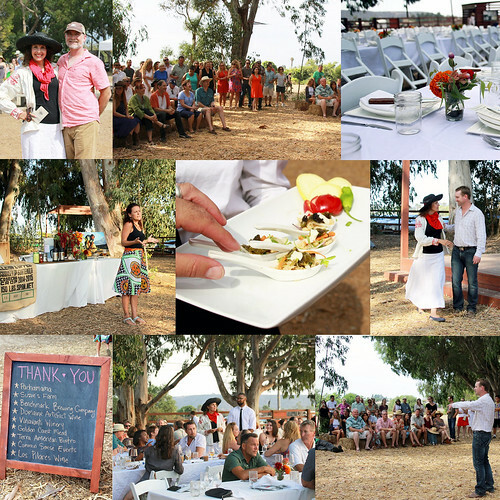 We are grateful to everyone who attended our recent dinner on Suzie's Farm benefiting The Jacobs and Cushman San Diego Food Bank. 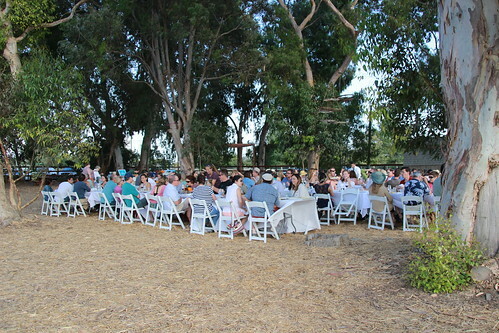 A special thank you our co-host and partner Lucila De Alejandro, chief farmer at Suzie's Farm for a fabulous location. Kudos to chef Jeff Rossman of Terra American Bistro for an outstanding meal, Benchmark Brewing Company, Los Pilares, Domaine Artifact, Golden Coast Mead and Vinavanti Urban Winery and Pachamama Coffee for exquisite libations. Thank you to the courteous staff at CSE Event Services for their service of the food and beverages throughout the event. The stories shared by those who attend out events really allow us to experience the event in a whole new way and make the very best stories. Here's one such story shared with us by Farm Fresh To you member Jennifer, on her own blog Stylishly Social, and graciously reposted here so we could share it with all of you! Thank you Jennifer!! 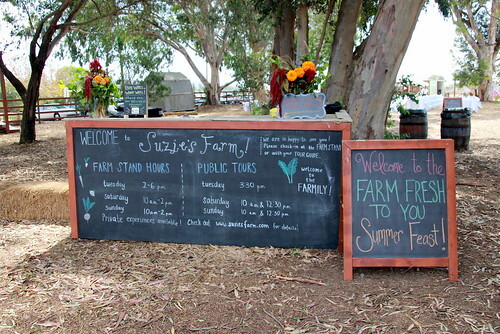 On Saturday, July 30th, Suzie's Farm and Farm Fresh To You hosted another wonderful Summer Feast on the Farm. 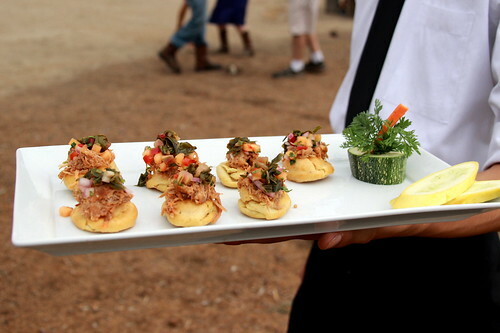 The meal was prepared farm-to-fork style by Jeff Rossman of Terra American Bistro. 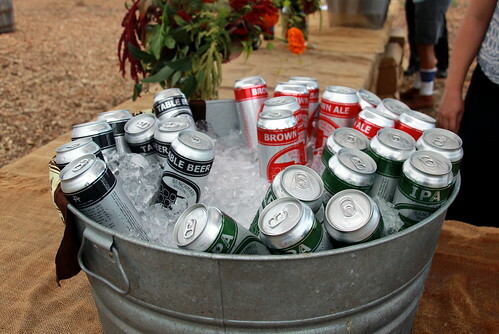 We were treated to beverages provided by Benchmark Brewing Company, Golden Coast Mead and Vinavanti Urban Winery as well as cold brew coffee from Pachamama Coffee Farmers. We were surrounded by beauty as we wandered around the farm and learned about exactly where our meal came from. The farm location was the perfect setting to meet new people and chat with Suzie's Farm owners Lucila de Alejandro and Robin Taylor. We enjoyed the selection of cold beer and mead as well as flavorful wine while dining on Chef Jeff's delicious appetizers. The tray-passed appetizers included Heirloom Tomato Flatbread, BBQ Pulled Pork Bao Bon, Bahn Mi Sandwiches and Beet & Feta Empanadas. Yum! We were treated to a talk from Farm Fresh To You owner Thaddeus Barsotti and a Q & A with the very passionate Lucila de Alejandro, owner of Suzie's Farm. We were then seated for our 4-course family style meal that began with a first course of Freekah Salad with Thai basil, kumquats, toasted hazelnuts, arugula and lemon vinaigrette. 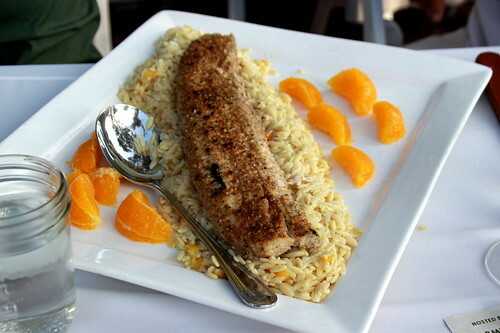 Our main courses consisted of Dukkah Crusted Fish with fennel orzo and Smoked Pork Tenderloin with a corn salad. 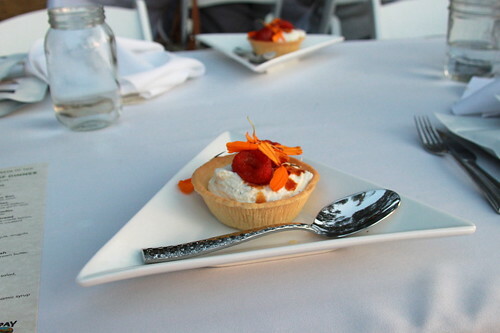 We then capped off the meal with a fabulous Roasted Strawberry Tart with ricotta-thyme crema and white balsamic syrup. One of the best things about this entire experience was that it benefited a great cause. Part of the proceeds from this wonderful 4-course meal were donated to the Jacobs and Cushman San Diego Food Bank. The Director of Corporate & Community Partnerships from the Food Bank, Sandra Rabourne, was in attendance at the event as well and spoke about the many ways in which our local food bank helps provide meals to those in need. The San Diego Food Bank also raises funds through numerous other local events including the San Diego Blues Festival in September. 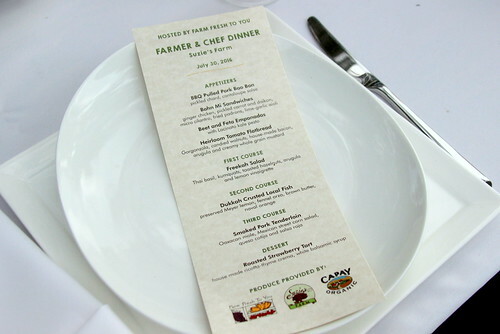 This dinner was a wonderful opportunity to learn more about exactly where our food comes from. If you ever have the opportunity to attend a similar Farm Fresh To You event, it truly is a great experience! You will walk away educated, inspired and moved by the passion involved in planning and preparing a meal like this from start to finish. You will also leave with a greater understanding of why it's so important that we put the right foods into our bodies and those of our children. I’m thrilled that I was able to attend another fabulous Farm Fresh To You event and can’t wait for the next one. 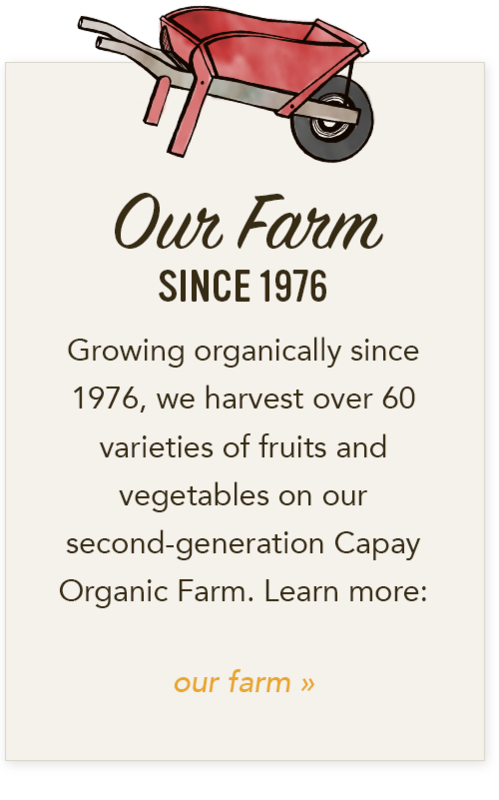 I’ve loved being a Farm Fresh To You member and knowing that I’m giving my children the very best options for produce. If you ever want to talk about my personal experience with the service, feel free to visit my blog at StylishlySocial.com or drop me an e-mail at jen@stylishlysocial.com. Hope to see you all at a Farm Fresh To You event soon! As kids, the long warm days of unbroken sunshine that made summer seem lasting and slow are the very things, that to farmers, make the season fly by with burgeoning lists of things to do—plants to watch and water—crops to harvest, sell and preserve. Here’s a quick sauce that allows you to revel in summer flavor without keeping you in a hot kitchen. Preserve every last precious drop of summer time. 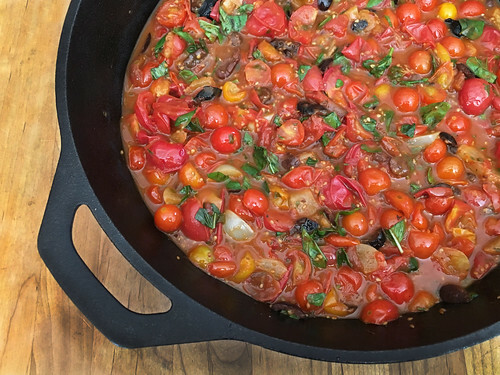 This sauce captures the bright, bursting flavor tucked inside little, sun-ripened cherry tomatoes. Flavor wise, they are such a reliable player in the tomato game. They’re juicy but not mealy, and their thin little skins don’t need to be peeled for sauces. Actually, the skins give a rustic charm and body to the sauce. 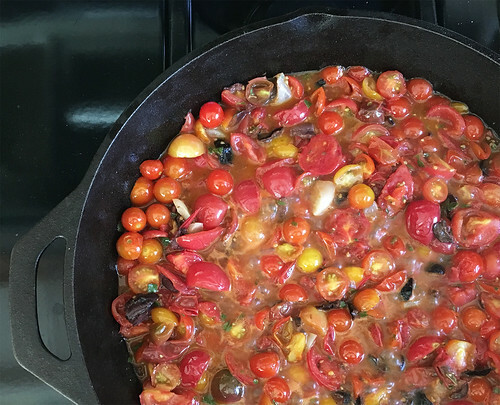 Put away your tall-walled sauce pot and grab a shallow-sided pan to let the tomatoes cook down and concentrate flavor quickly. Our favorite is a well-seasoned cast iron skillet. It the spirit of the summer season, it’s a loose recipe that allows you to lazily use what you have on hand. If you don’t have cured olives, reach for another flavor booster like salty anchovies or pancetta. On occasion, I’ve even snuck in a cup or two of already-cooked, roasted summer veggies – eggplant, zucchini, mushrooms. Raw veggies can add a little too much liquid and bring down the intensity of flavor. It’s okay that this sauce turns out a little different every time because that’s how summer tastes. The sauce is delicious with chunks of rustic sourdough dipped in, as a topping for tender fish or over any of our artisan pastas. How are you enjoying simple summer flavors? Add olive oil to cold pan. Smash garlic cloves directly into oil, slowly softening garlic over gently heat to infuse the oil with flavor. Turn down heat if garlic starts to brown too quickly. Once garlic is soft and lightly golden, turn heat up to medium and add Kalamata olives or other flavor boosters mentioned above and sauté briefly to warm and soften. Add cherry tomatoes and oregano to pan. Turn up the heat to medium high and allow to simmer, cooking for 20 minutes or until tomatoes are fully cooked, juices incorporate and sauce thickens. Sauce shouldn’t be rapidly boiling but a heavy simmer is okay. Remove sauce from heat and gently stir in fresh basil and butter. Salt and pepper to taste. 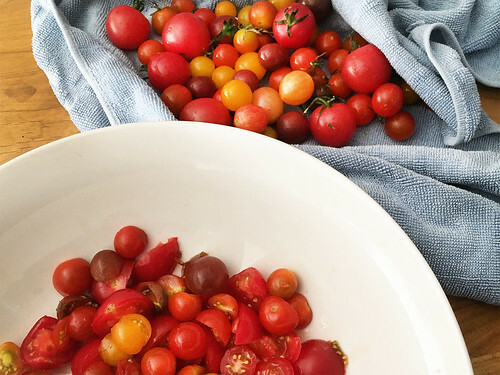 How To Add Cherry Tomatoes To Your Delivery: CSA members - head on over to our online Farm Stand Market to customize your upcoming delivery. The Market is open from noon on Thursday until 10 am, 2 days before your scheduled delivery day. After you confirm your produce items, click the orange button "Confirm and Continue To Other Farm Products" to add the products to your delivery. Planting winter squash is a delicate business; planting must happen in July. This is a crucial deadline because if this crop is planted much later than the fourth of July there is a chance that the weather will cool down and get wet before the squash has had a chance to mature. This happened to me once, in my younger days, and I do not plan on ever letting it happen ever again.